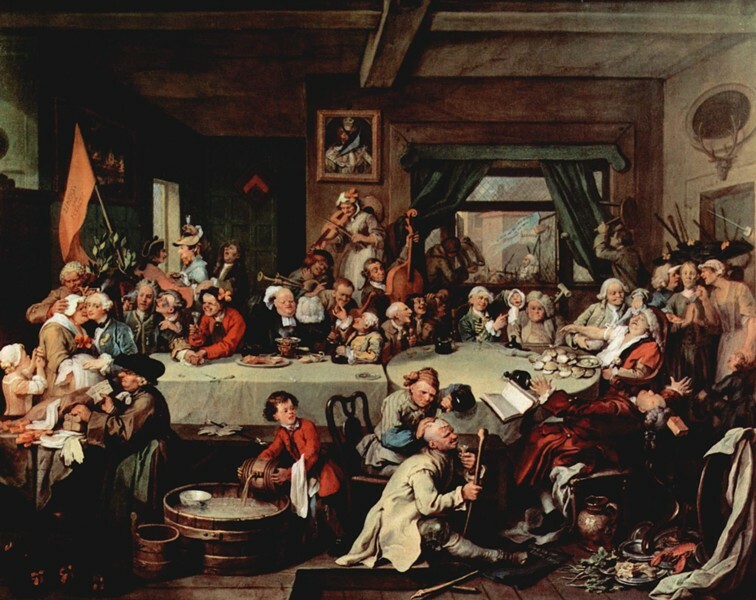 One of William Hogarth’s “Humours of an Election” satirical paintings of 1755 shows a “Give us our Eleven Days” banner (on floor) protesting against the 1752 switch to the Gregorian calendar. Did the year once start on March 1? Yes. Four thousand years ago, Mesopotamians celebrated the beginning of the year at the spring equinox, approximately March 21 by our calendar. Later, the early 10-month Roman calendar designated the first day of martius, March, as New Year's Day. This is still reflected in our apparently mis-named ninth to 12th months: September (Latin septem, seven), October (octo, eight), November (novem, nine), and December (decem, 10). Our 12-month calendar dates back to about 700 BCE when the second king of Rome, Numa Pontilius, added the months of January and February. In 153 BCE, the "official" date of the New Year was designated Jan. 1, to coincide with the beginning of the Roman civil year when the two newly-elected Roman consuls (the highest officials in the republic) began their one-year tenure. Julius Caesar instituted the solar-based "Julian" calendar in 46 BCE, replacing the old lunar-based Roman calendar which had grown increasingly out-of-step with Earth's seasons. Did Galileo die the same year Newton was born? Yes and no. The two people most responsible for ushering in the modern age of science are Galilei Galileo ("perhaps more than any other single person ... responsible for the birth of modern science" -- Stephen Hawking) and Isaac Newton (founder of classical mechanics and optics and co-founder of calculus). It's commonly noted that 1642 was the watershed year when Galileo died and Newton was born, but the calendar change from Julian to Gregorian makes for ambiguity. Galileo died in Arcetri, Italy, on Jan. 8, 1642, according to the Gregorian calendar (adopted in Italy in 1582) while Newton was born 361 days later in Woolsthorpe, England, on Dec. 25, 1642, by the Julian calendar then in use in Britain. (England didn't adopt the Gregorian calendar until 1752.) So if you go by the different calendar systems in use in each country at the time, yes, they were born in the same year. Otherwise, no. Similarly, William Shakespeare died on April 23, 1616 (Julian calendar) and Miguel de Cervantes died on the same date in 1616 (Gregorian, then in use in Spain), but 10 days earlier. Is the replacement of "BC" by "BCE" and "AD" by "CE" a godless commie plot? Not officially! CE, for Common Era (and BCE, Before Common Era) is a secular alternative to the calendar era AD (Anno Domini, Year of Our Lord) introduced by Christian monk Dionysius Exiguus in the sixth century. BC is, of course, Before Christ. In the mid-1800s, Jewish writers wanting to sidestep the theological implications of AD/BC began using the CE abbreviation, although astronomer Johannes Kepler had used "vulgaris aerae" (Latin for "common era") back in 1615. The switch from AD/BC to CE/BCE has accelerated in the last few years. For instance, the World Almanac dropped AD/BC in 2007 after 138 years of use. A cogent argument for dropping AD/BC was made by former U.N. Secretary-General Kofi Annan: "The Christian calendar no longer belongs exclusively to Christians. People of all faiths have taken to using it simply as a matter of convenience. ... Some shared way of reckoning time is a necessity. And so the Christian era has become the Common Era." Barry Evans (barryevans9@yahoo.com) made the switch to CE/BCE three years ago.